Nothing delights Americans more than when a taco goes too far. A taco with a shell made out of Doritos? Tacos, you go too far. A taco with a shell made out of a different kind of Doritos? Tacos, you go further still. Now Taco Bell is enabling tacos to cavort above their station once more; this time, it's allowing them to be waffles. Brand Eating was the first to report on the latest chapter in tacos' ongoing evolution into sentient beings, after an Instagram user in Southern California posted a photo of the waffle taco (and its accompanying heraldry). While the waffle taco contains no standard taco ingredients—each wafflaco consists of a waffle, folded around a sausage patty, folded around some scrambled eggs—and is therefore not a taco in the "classic" sense, the resulting pocket of food is certainly shaped like a taco. It's a taco in the sense that a loose leaf binder full of papers is a taco. It's a taco in the sense that your cupped palm holding a marble is a taco. During this test run, the wacka flocko is retailing for $0.89, a price so cheap it's almost like you are saving money by buying it (you are not; you are spending $0.89). Food Beast notes that it is served with a shot of syrup and sold only until 11 a.m. 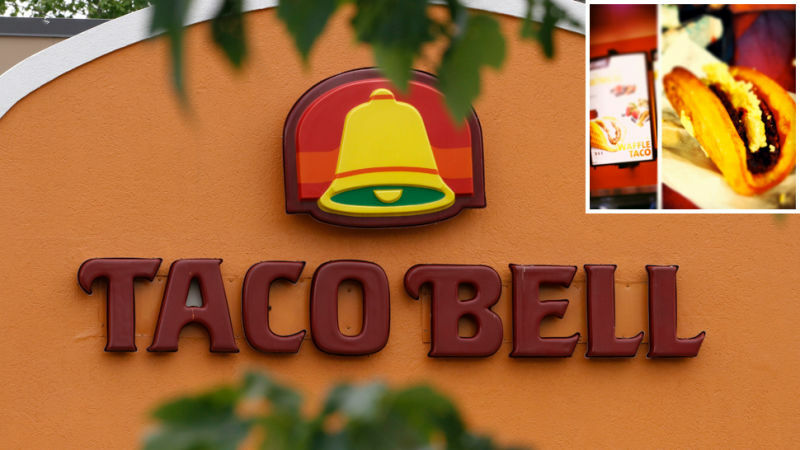 While the item is currently only available in select California locations, Taco Bell is already trying to make it happen. And being weirdly hostile about it. Tacos, you go too far. To contact the author of this post, email caity@gawker.com.